CMX is Joining Forces with Bevy! Five years ago, we hosted the first ever CMX Summit in San Francisco, with a dream of bringing together the world’s community professionals. Since then, we’ve worked tirelessly to establish this new category, and define what it means for a business to build community. We hosted eight more conferences in SF, NY, LA, and Portland, published hundreds of free articles and three research reports, launched training and membership products, consulted and trained hundreds of organizations, licensed our frameworks to Facebook to train millions of group admins, and grown the CMX community to close to 20,000 members across platforms. It’s been a wild ride and we’re incredibly proud of the work the team, and this community, has put in to get the industry to where it is today. That said, our vision has always been even bigger. We want the event to be a global gathering of ALL the major platforms, people and brands in the space. We want to see thriving events hosted around the world by community professionals. We want this industry to have access to high-quality training and research to give you the insights and data you need to do great work. But it hasn’t always been possible to go big, because CMX is a small, bootstrapped team. Most people don’t know that CMX is only three full-time people. Over the last few years, we’ve been able to keep creating and growing in large part thanks to our incredible partners. One of our key partners has been Bevy. I met Bevy’s co-founder/CEO Derek Andersen a couple years ago when he spoke at CMX Summit. They’ve been supporting us as partners and sponsors ever since, and Derek quickly became a friend and a mentor. As we worked together, the idea kept coming up, that we could have a lot more impact by teaming up. A few months ago, we started seriously considering that path, getting to know each other’s teams, values, and visions. We learned that we’re aligned on all the important things, and that was the right move for the community and the industry. 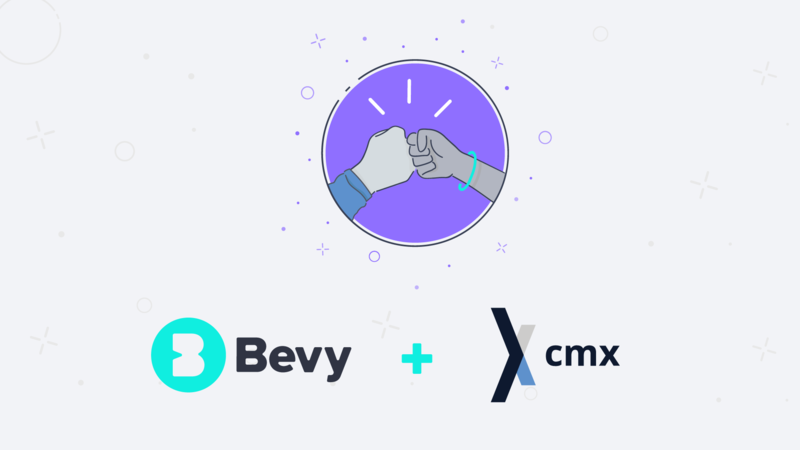 Today, I’m excited to announce that Bevy has acquired CMX. We will work together to accelerate the CMX mission. The full CMX team will be joining Bevy. I will continue to lead CMX, and will also be taking on the role of VP of Community for Bevy. Bevy is a relatively new software platform in the community industry that’s already making big waves. They provide a service I’ve long believed was needed, helping companies run distributed event programs, so their local ambassadors around the world can host their gatherings using the same platform, and the company can manage all the branding and data from one central hub. I highlight “data” because I think that’s what’s really powerful – a brand can finally get the data they need to understand how their customers are coming together in real life, and how that’s impacting revenue. We know that community teams need access to better data in order to report on the value of their work. With Bevy, they’ll be able to track all their event data in one place. Bevy’s built a really impressive team in a short amount of time, and are already generating significant revenue while working with brands like Slack, Atlassian, Asana, Qualtrics, Duolingo, and more. It’s the kind of company I’m really excited about. I think they’re one of the platforms that represent the future of the community industry. Most importantly, they fit really well with the work CMX has done and the direction we see things going. Now, the obvious question: What will change? The truth is, some things will change. We may cut things that we don’t need to do anymore because we can focus on long term impact and revenue over short term survival revenue. For example, we will likely cut back on some consulting and recruiting work we’ve done. We will launch new initiatives that we can now safely invest in. For example, we’ll be kicking off our local events program in a much bigger way, and hope to have CMX events being hosted in cities around the world. The 10th CMX Summit will be hosted this year, and it will be bigger and better than ever. We will continue to innovate on our most recent product, CMX Pro. We don’t know all the ways that things will change. I don’t think any company that gets acquired ever truly knows exactly what will happen. What I do know is that our visions and intentions are clear, and aligned with Bevy. As we move into this next phase of our journey with the CMX community, we will continue to be transparent, and we know you’ll keep us accountable. Reaching this point has been an incredible, and difficult journey, and there will be more exciting and difficult roads to navigate ahead. None of it would be possible without all the people who have contributed to CMX as team members, contractors, mentors, volunteers, community members, and partners over the years. So I want to express my deepest gratitude to all of you, and give a special shout out to the CMX Team, Erica McGillivray and Sam Weber, and to past team members Carrie Jones, Max Altschuler, Evan Hamilton, Katie McCauley, Yrja Oftedahl, Leah Kahn, and Matt Roney. It’s never been a better time to be a community professional. Your work is needed more than ever before. I’m grateful for the opportunity to double down on this space, and excited to continue to tackle the big challenges the community industry faces.